Download "AMERICAN BAR ASSOCIATION SECTION OF LABOR AND EMPLOYMENT LAW NATIONAL CLE CONFERENCE 2011 SEATTLE, WASHINGTON"
3 Types of electronic evidence: Website content Social networking sites Voic Animations / simulations Database materials PowerPoints, Excel spreadsheets, etc. 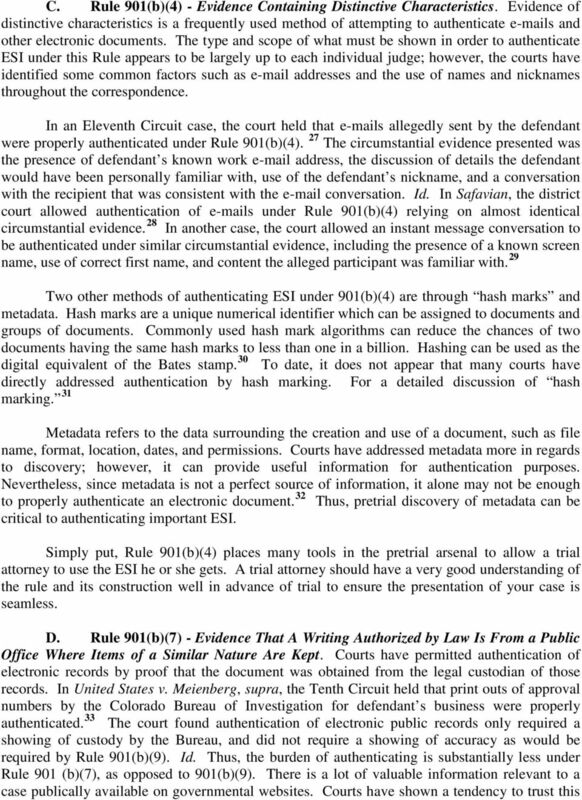 Metadata It is important to remember that there is nothing magical about the admission of electronic evidence. 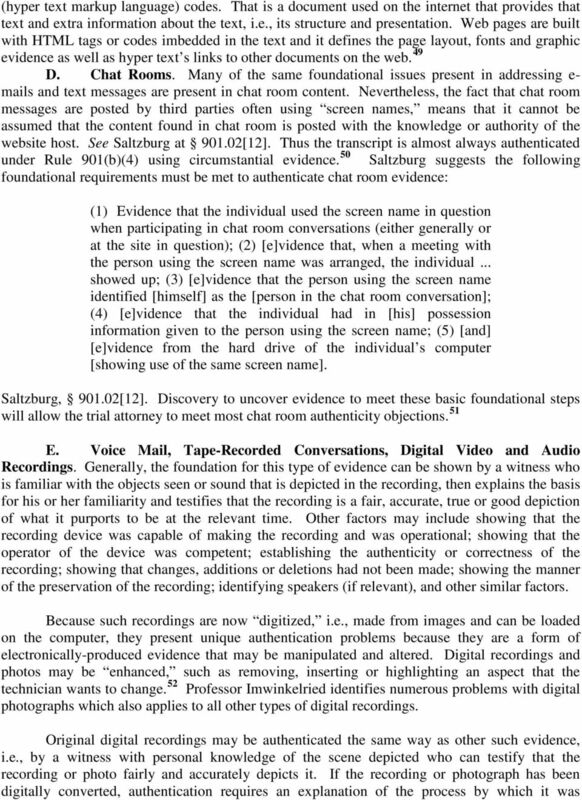 The prevalence of electronic evidence has required no substantial changes to the Federal Rules of Evidence. 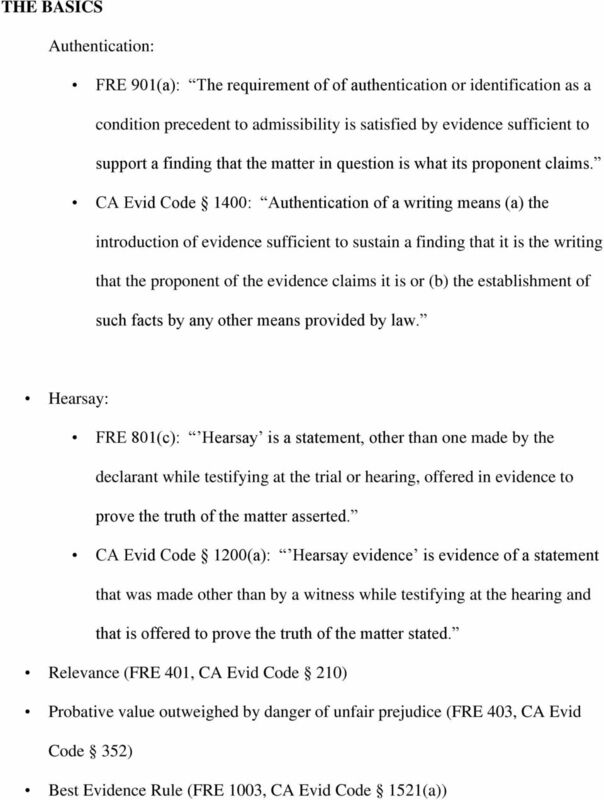 In analyzing the admissibility of such evidence, it is often best to treat it as originating from the most similar, non-electronic source as thoughtful application of traditional evidentiary principles will nearly always lead to the correct result. 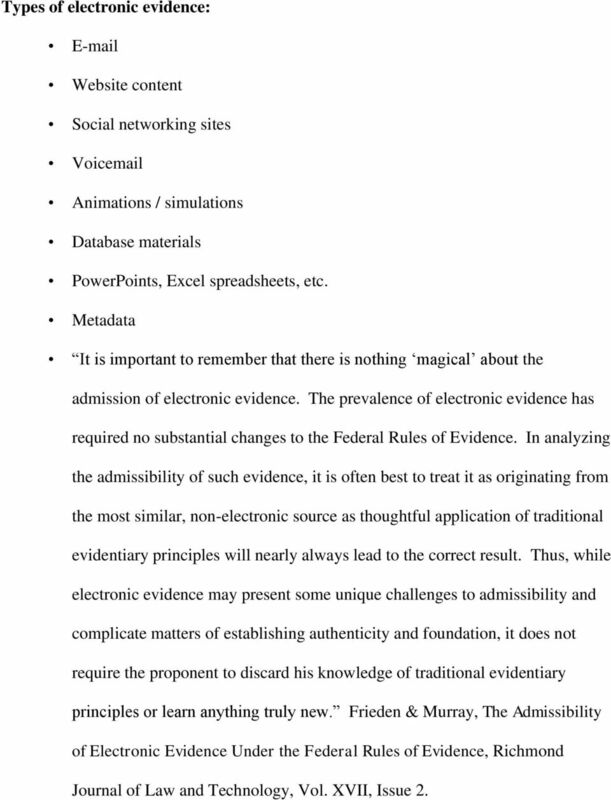 Thus, while electronic evidence may present some unique challenges to admissibility and complicate matters of establishing authenticity and foundation, it does not require the proponent to discard his knowledge of traditional evidentiary principles or learn anything truly new. 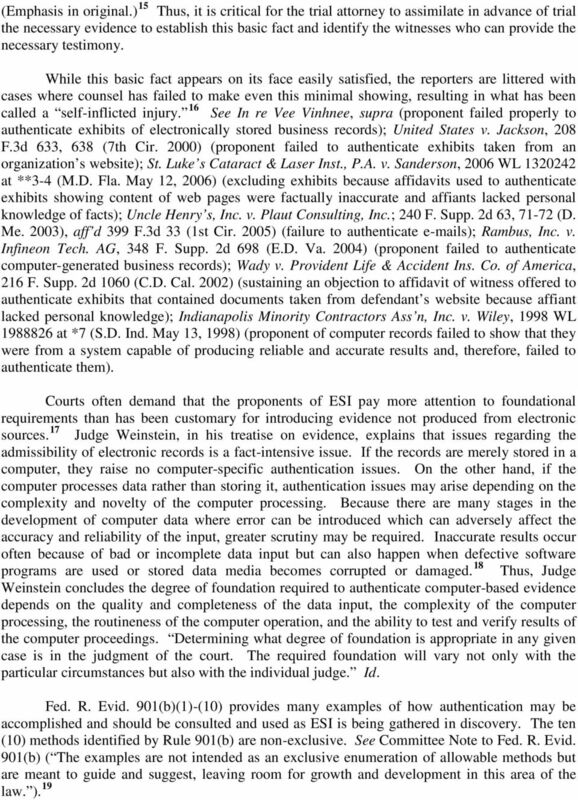 Frieden & Murray, The Admissibility of Electronic Evidence Under the Federal Rules of Evidence, Richmond Journal of Law and Technology, Vol. XVII, Issue 2. 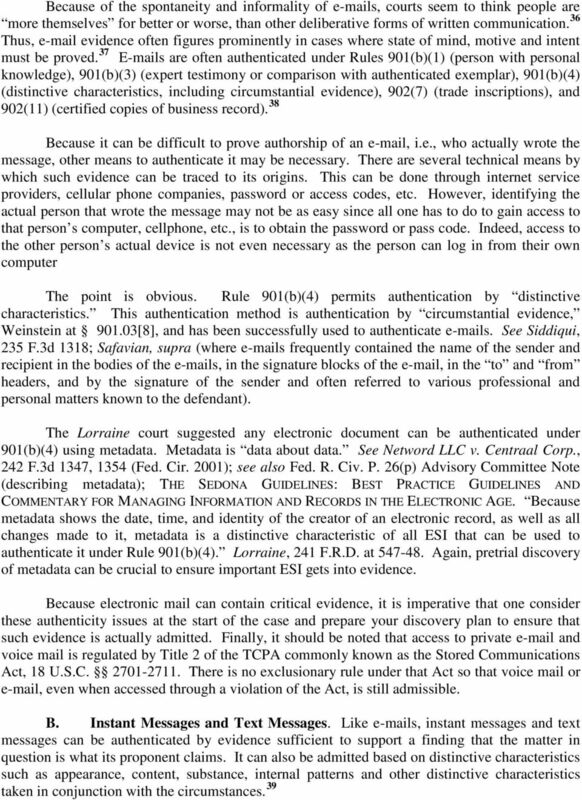 4 The most significant case discussing evidentiary issues with virtually every form of electronic evidence is LORRAINE v. MARKEL AMERICAN INSURANCE COMPANY, 241 F.R.D. 534 (D. Md. 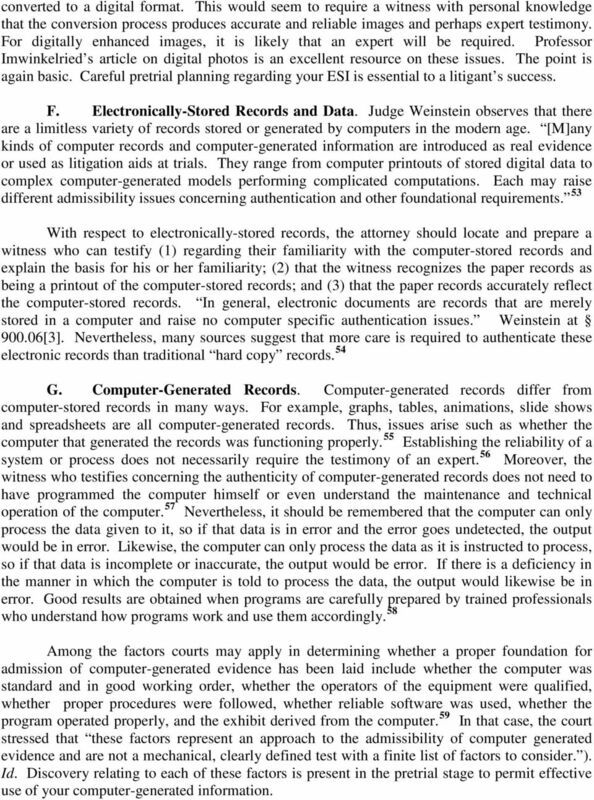 2007), authored by Magistrate Judge Paul Grimm, one of the most knowledgeable jurists on issues related to electronic evidence. 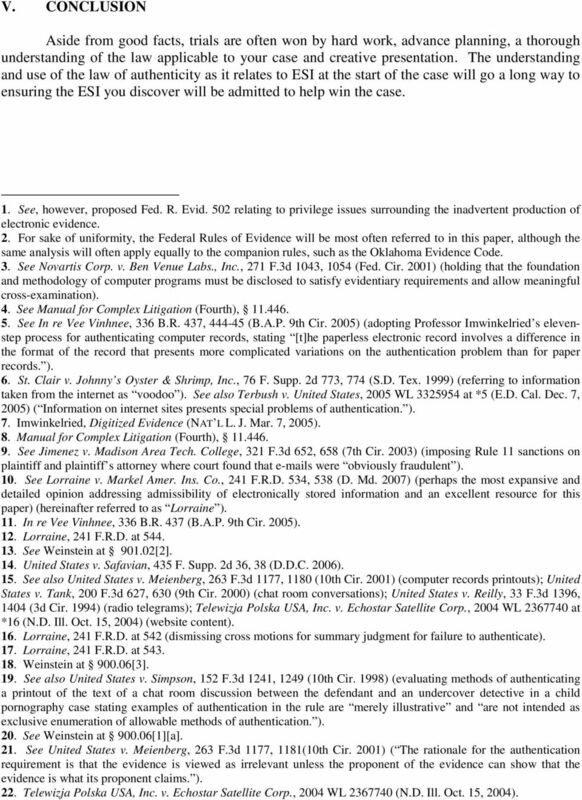 Nearly encyclopedic in detail, it should be consulted whenever questions arise about such evidence. 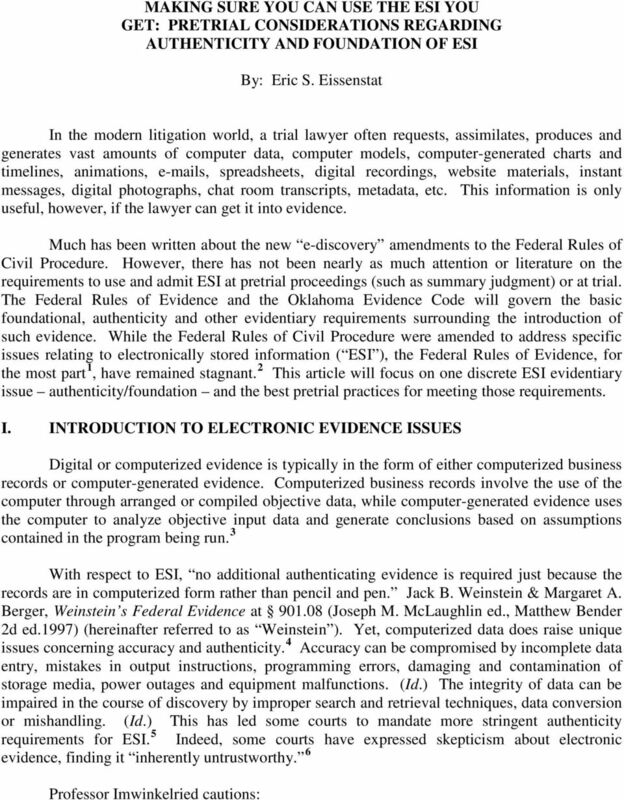 The attached article is reprinted with kind permission from Eric Eissenstat, a practitioner in Oklahoma City, Oklahoma, and again, provides a wealth of information on evidentiary issues related to electronically store information (ESI). 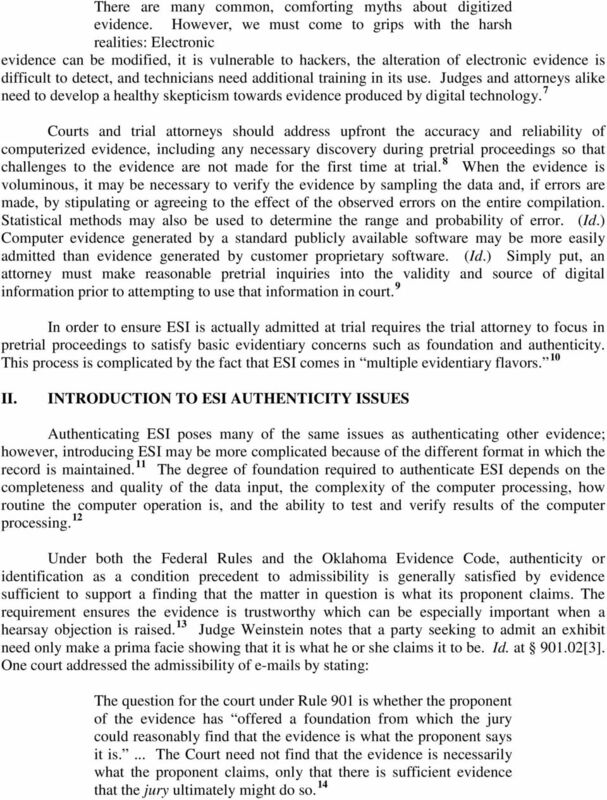 MAKING SURE YOU CAN USE THE ESI YOU GET: PRETRIAL CONSIDERATIONS REGARDING AUTHENTICITY AND FOUNDATION OF ESI. By: Eric S.
IN THE DISTRICT COURT OF APPEAL OF THE STATE OF FLORIDA FIFTH DISTRICT CRISTOBAL COLON, Appellant, NOT FINAL UNTIL TIME EXPIRES TO FILE MOTION FOR REHEARING AND DISPOSITION THEREOF IF FILED v. Case No. HONORABLE RICHARD A. JONES 1 1 1 MICHAEL CONTI, v. ORDER 1 Plaintiff, CORPORATE SERVICES GROUP, INC., et al., Defendants. 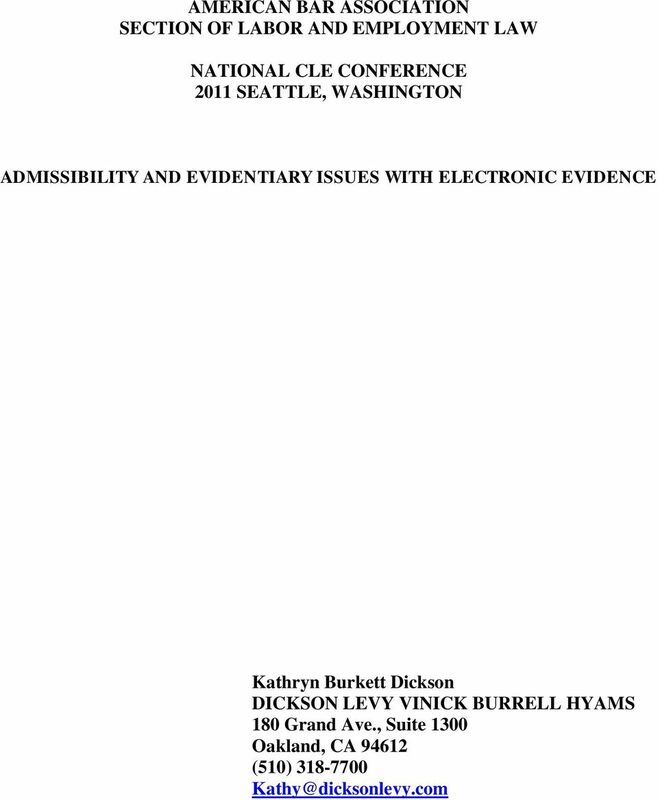 UNITED STATES DISTRICT COURT WESTERN DISTRICT OF WASHINGTON AT SEATTLE CASE NO. Case 2:03-cr-00122-JES Document 60 Filed 02/19/08 Page 1 of 7 PageID 178 UNITED STATES DISTRICT COURT MIDDLE DISTRICT OF FLORIDA FORT MYERS DIVISION FRANCIS MACKEY DAVISON, III, Petitioner, vs. Case No. IN THE UNITED STATES DISTRICT COURT FOR THE WESTERN DISTRICT OF TENNESSEE WESTERN DIVISION RAY BRUNSON AND MARY BRUNSON, Plaintiffs, vs. No. 07-2320-MaV STATE FARM FIRE AND CASUALTY, COMPANY, Defendant. 23 A.3d 818 (Conn.App. 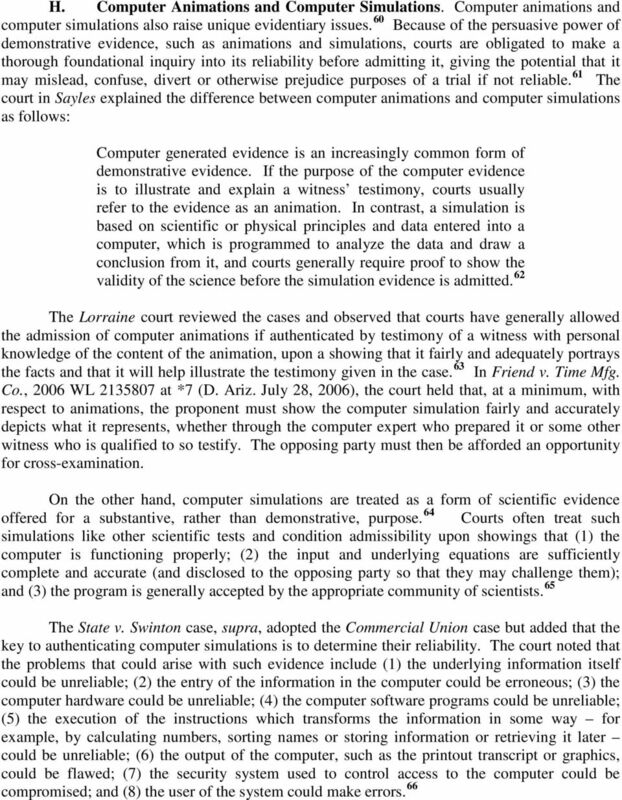 2011), 31581, State v. Eleck Page 818 23 A.3d 818 (Conn.App. 2011) 130 Conn.App. 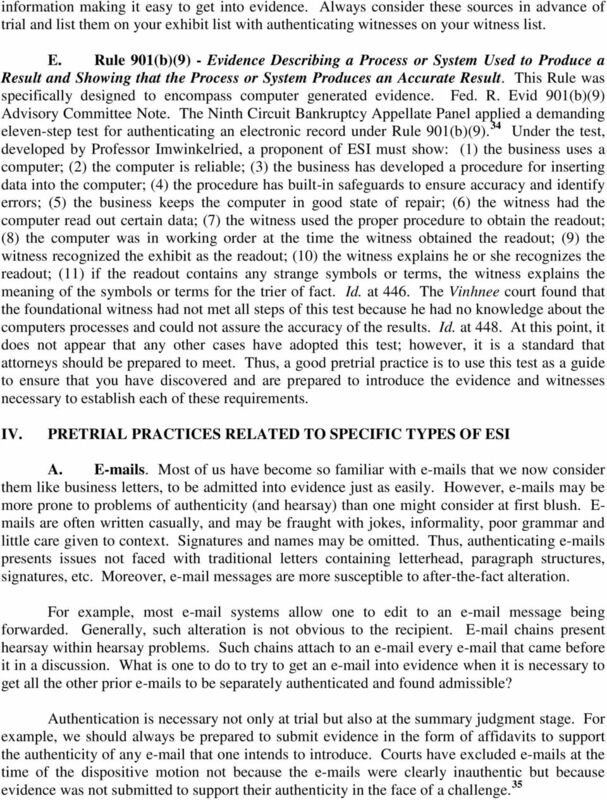 632 STATE of Connecticut v. Robert ELECK. No. 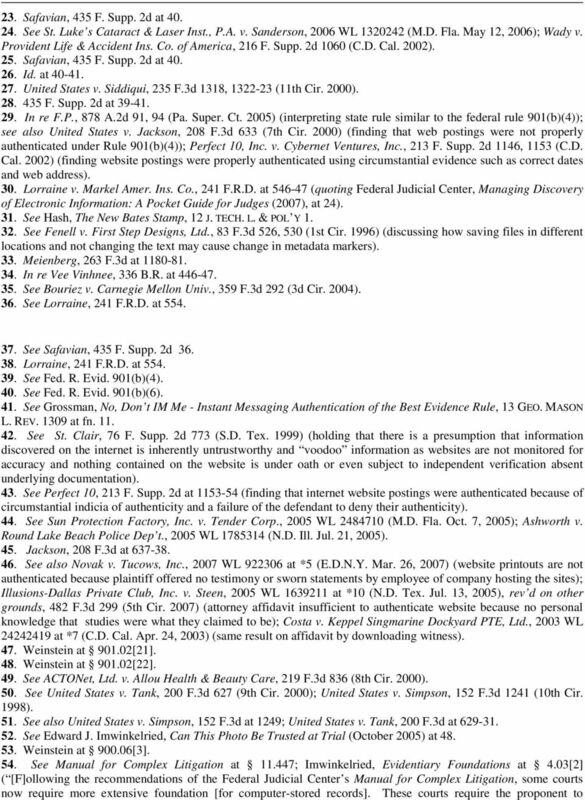 Coniglio et al v. Bank of America, N.A. Doc. 31 NELSON CONIGLIO and JOYCE CONIGLIO, husband and wife Plaintiff, IN THE UNITED STATES DISTRICT COURT FOR THE MIDDLE DISTRICT OF FLORIDA TAMPA DIVISION v.
THE IMPACT OF DAY IN THE LIFE VIDEOS IN CATASTROPHIC INJURY CASES Presented and Prepared by: Roger R. Clayton rclayton@heylroyster.com Peoria, Illinois 309.676.0400 Prepared with the Assistance of: J. 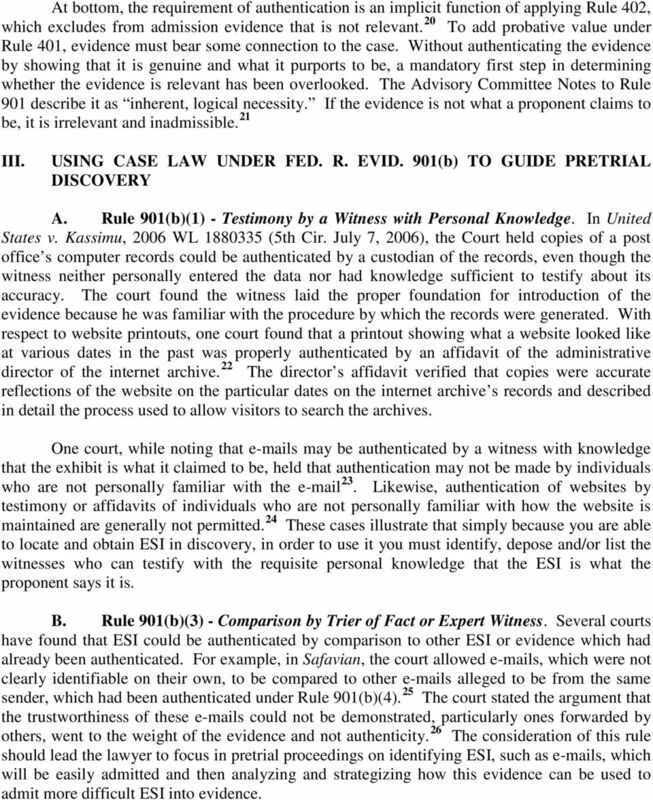 Case 1:12-cv-08333-ALC-SN Document 978 Filed 05/07/15 Page 1 of 6. Plaintiffs, Defendant. Case 2:04-cv-01053-HGB-DEK Document 190 Filed 07/25/07 Page 1 of 10 UNITED STATES DISTRICT COURT EASTERN DISTRICT OF LOUISIANA VERSUS NO.